You are at Disney World. You are starving. WHAT DO YOU DO?! 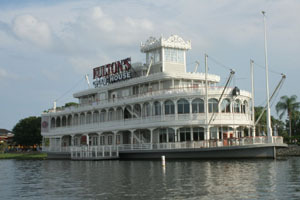 There are many great restaurants in and around the Disney World parks. I have compiled this list of Disney World restaurants in the Magic Kingdom, Downtown Disney, EPCOT Center, Typhoon Lagoon, Disney's Animal Kingdom, and Disney's Hollywood Studios. Looking for restaurants inside the Magic Kingdom? Take a look at my list of Restaurants inside Disney World's Magic Kingdom. I'd also love to hear about YOUR favorite restaurant! At the bottom of this page you'll find a place where you can share what you love about your favorite restaurant in and around Disney World. Click here to jump there now! What Disney World restaurants are near Downtown Disney? What are YOUR favorite (or most hated) restaurants near Disney World? Do you have an amazing restaurant near one of the Disney World parks to recommend? Was the food unbelievably awesome, the service fast and friendly, and the price reasonable? Or did you find a Disney World restaurant that you would NEVER go to again? Was the food GROSS (or worse, make you SICK), the service sloooow, and the prices outrageous? This is your chance to advise other Disneyworld vacationers. To what Disney World restaurant should they DEFINITELY go? And what restaurant should they AVOID like the Plague? Be sure to tell us which Disney World Park your restaurant is near. Do you have some pictures of your restaurant experience to add to your review? Click the button and find the first one on your computer. Select it and click on the button to choose it.